How Is Climate Change Affecting Vermont Right Now? After weathering Tropical Storm Irene in 2011, and another major flood in July of 2017, Michael and Stacy Lee of Brandon have decided to take a buyout for their flood-prone home. We know the predictions are dire; we know there are urgent conversations to be had about policy. But to answer this listener question, we stay focused on the present. Editor's note: Our show is made for the ear. As always, we recommend listening if you can! On a typical Thursday this past January, Cheri Bishop was standing at her kitchen sink, preparing a salad for lunch. Then she looked out her window, and noticed that brown water was pooling in her yard and around her home. It was coming on fast. Cheri lives in Mountain Home Park, a mobile home community in Brattleboro about 4 miles from downtown. The park runs along the Whetstone Brook. While Cheri’s lot is across the park from the brook, her lot is the lowest in the area. Cheri and her son’s two cars were parked in front of her house, and she could see that they were going to get flooded. So she grabbed the keys to one car and moved it above the water line. In her rush, she had forgotten the keys to the other car, so she had to head back to the house. By now, the floodwaters had risen up to around 3 feet. There was ice and debris in the water, and who knows what else. Remember, this is January. Cheri got back to the house, grabbed the keys to the other car, and was able to move it just as the water was going over the doors. The flood was caused by an ice jam. Temperatures in Brattleboro had risen quickly, from sub-zero to the upper 40s, and up to 3 inches of rain had fallen. This had caused thick ice on the Whetstone Brook to melt, break up and hurtle downstream, where it eventually got stuck and created a dam. The next day, crews carefully broke up the ice and the water receded. But this presented a new problem. Cheri’s husband took pictures right after the flood that show her whole yard covered in a thick, dark sludge. In the pictures, the bottom portion of her mobile home — what’s called the skirting — is caked in mud. 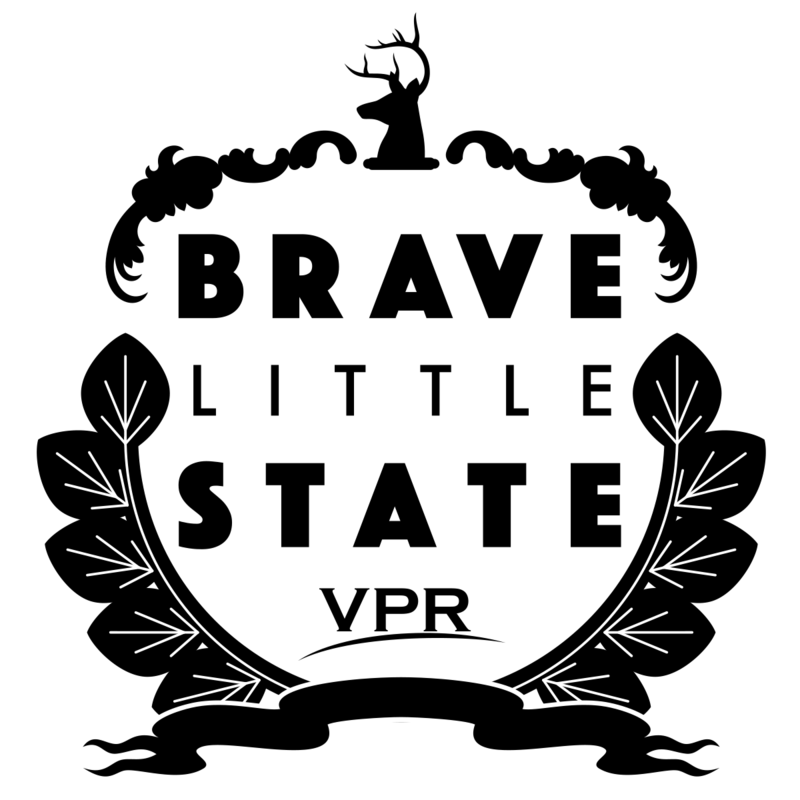 Brave Little State is VPR's people-powered journalism project. When the weather warms up, her husband will hose out underneath the home to prevent mold and other health hazards. Cheri grew up in Mountain Home Park, and has lived in this spot for 35 years. Over the last decade, she’s gotten a crash course in how to deal with flooding. Cheri believes that flooding has gotten worse since Tropical Storm Irene hit in 2011. “The rain is coming more our way, we’re getting more of the rain,” she said. According to the latest National Climate Assessment, average annual precipitation in Vermont has increased nearly 6 inches since the early 20th century. Extreme rainfall events are projected to become more extreme and more frequent. And ice jams like the one that flooded Mountain Home are also increasing, as Vermont gets less snow in the winter and more rain — that’s according to the 2018 Vermont State Hazard Mitigation Plan. All of this means more flooding for many Vermonters. This month on Brave Little State, VPR’s people-powered journalism project, we meet a few of them. If you’re not familiar with how Brave Little State works, we answer questions about Vermont that have been submitted and voted on by you, our audience. Our winning question-asker this month is Jack Haskell, of Brattleboro. Jack asked us this question: "How is climate change affecting Vermont right now?" This month's brave question-asker is Jack Haskell. Jack is studying climate change education at the School for International Training in Brattleboro. Jack already knows a lot about this topic. But the “right now” portion of his question is critical: Jack said he wanted to avoid the more abstract predictions about climate change, about things like animal migration and shrinking ice caps. “I think it would be good for people to hear how it's affecting people,” he said. Jack’s theory is that putting a human face to climate change will make people more likely to pay attention, and hopefully more likely to take action toward mitigating climate change. So to answer his question, we try to understand what is happening to people, right now. We think Jack has a great angle here. Because we are actually living in an era where people have an outsized influence. It’s called the anthropocene, and it’s the name of the geological age we’re in. “It is the so-called ‘age of humans.’ And it acknowledges the massive influence that human activities, human decisions, have in, at this point, determining the composition of the oceans, the composition of the atmosphere,” says Dan Suarez, an assistant professor of environmental studies at Middlebury College. At the same time, Dan points out that conversations about climate change sometimes lack nuance about demographics — different groups of people. Like, you often hear that “we” are causing climate change. But “we” aren’t all experiencing the same thing. Our question-asker Jack is aware of this. “Climate change has the tendency to affect people living in poverty and communities of color more so than other groups,” Jack says. This is what’s known as environmental justice: the idea that some people are affected more than others by environmental hazards and catastrophes. And Dan says this is not just happening in faraway places. Brave Little State met Lauren in the middle of Quechee Village — a spot that got hit hard by Tropical Storm Irene in 2011. If you lived in Vermont during Irene, it’s probably the first thing you think of when you hear the word flooding. If Irene was before your time, you might look it up; it caused more than $700 million in damage. But here’s the thing: There have been a lot of floods since then. Lauren’s office published the 2018 State Hazard Mitigation Plan, subtitled “Making Vermont safer and more resilient in the face of climate change and natural disasters.” And according to that plan, the #1 and #2 most significant natural hazards in Vermont are both flooding. Two different kinds of flooding, called fluvial erosion and inundation flooding. “The easiest way to understand it is, inundation is a vertical change in the water, so up and down, and fluvial erosion is a side-to-side movement where the river just charts a new course entirely,” Lauren explains. In central Vermont, in the town of Brandon, we meet Stacy and Michael Lee. They live on Newton Road, which cuts through an open field at the base of the Green Mountain National Forest. Also at home: two energetic labs and a golden retriever, and two Persian cats that belong to their daughter. “These guys have been through floods, they’ve been through everything. They’ve been carried out in little cat backpacks,” Mike says. “The last time we flooded, the dogs swam out, and we had the cats on our back in the backpacks,” Stacy adds. She says “the last time we flooded” because it’s happened more than once. The Neshobe River runs a few hundred feet behind the Lees’ white ranch. It flows down from Goshen, in the mountains, and in recent years it’s gotten destructive. 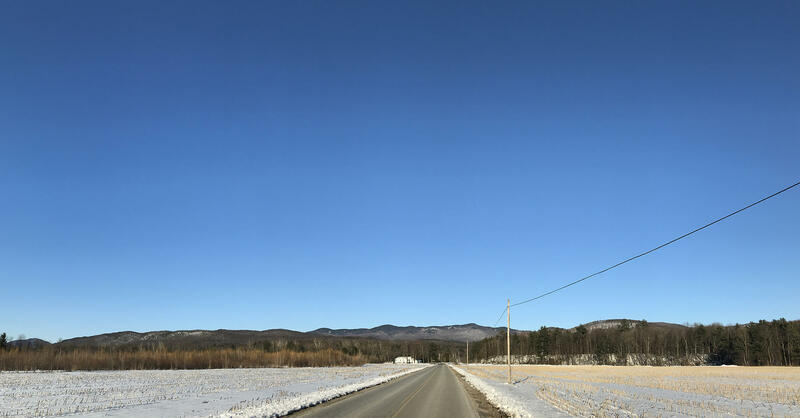 Newton Road in Brandon cuts through a flat, open field at the base of the Green Mountain National Forest. Here, the Neshobe River flows down from the mountains, in Goshen. In recent years, the river has gotten destructive. Irene did more than $40,000 in damage to the Lees’ house, which their flood insurance paid. After all their repairs, they thought they were in good shape. Fast-forward to July 1, 2017. More than 3 inches of rain fell that weekend, onto soil that was already saturated from previous rain. This was a storm that hit some parts of the state, and even some of the Lees’ neighbors, worse than Irene. But for Stacy and Mike it wasn’t as bad. But if you’ve been through Irene, “bad” is relative: The Lees had 18 inches of rain in their basement. “Yeah, well, we had two 2-and-a-half-inch pumps going full time,” Mike says. “I think if it wasn’t for those pumps we would’ve been right to the floorboards again. But we fought, you know, we fought. Everybody fights. I wouldn’t quite say we won, but I would say that…” he trails off. It’s actually really hard to get the Lees to tell the story of the July 2017 storm, because they keep blending it with the story of Irene. It’s like their memories are water-damaged. Stacy isn’t the only one feeling this way. Heavy precipitation events in the Northeast have increased by 55 percent since 1958. And such events have become even more frequent in Vermont since 2005, according to Lesley-Ann Dupigney-Giroux, Vermont’s state climatologist and a geography professor at the University of Vermont. She’s also the lead author of the Northeast chapter of the 2018 National Climate Assessment, a Congressionally-mandated report on climate change. Lesley-Ann said these stats hold true regardless of how you define an “extreme” event, whether it be 1 inches or 4 inches (and she does caution against using the term “extreme precipitation events” without defining each event). Part of the increase in these extreme precipitation events is due to what the National Climate Assessment calls a “warmer world.” Warmer air temperatures cause more evaporation, which means more water vapor in the atmosphere. This results in more frequent and intense precipitation. In Vermont, there’s another reason for extreme weather events: Lesley-Ann says the state sits at the center of a “bullseye” of multiple storm systems. These extreme weather events can contribute to a higher risk of flooding, according to the National Climate Assessment. But there’s an important distinction that needs to be made between precipitation and flooding, according to Lesley-Ann: Precipitation can be a contributing factor to a flood, but it’s not always involved. Lesley-Ann said each flood is like a puzzle, with lots of different pieces making the water rise. “When the river overtops its banks and spills onto the flood plain, that’s one piece of the puzzle,” she said. However, many other puzzle pieces must be considered, including the type of soil, how much moisture is already in it, land use, water management and more. When all of these factors combine in certain critical ways, that’s when flooding is created to “a disastrous effect,” according to Lesley-Ann. “I think what people tend to forget is flooding is a natural process, and it gets exacerbated by lots of development within flood plains and/or development in the headwaters,” says Frank Magilligan, a professor of geography at Dartmouth College. Frank is a fluvial geomorphologist — in layperson’s terms, an expert in flooding. He’s been studying them since graduate school. Frank points out that more rain isn’t the only thing causing more intense floods. Our development patterns do, too — think of how many roads run along rivers and get washed out. And then there’s topography. There are characteristics of Vermont’s landscape that make us particularly vulnerable to flooding. 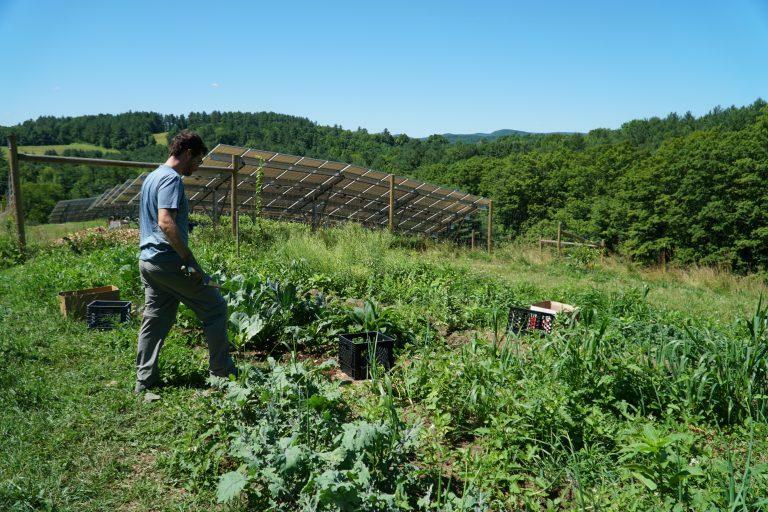 “Especially along the eastern flank of the Green Mountains, most of the tributary systems along eastern Vermont tend to be very, what we would call ‘confined’ valleys,” Frank says. Narrow valleys, where there are also roads. “It’s really trying to better nail down what percent or how much of a given storm can we attribute to climate change,” Frank says. The July 2017 storm that hit Mike and Stacy Lee? That was a microburst. Frank studies how rivers respond to floods. But he inevitably observes how people respond, too. When it comes to who is most impacted by flooding in Vermont right now, proximity to water matters, and so does what kind of structure you live in. A 2012 University of Vermont study found that 12% of mobile home parks are located in flood hazard areas — three times the share of single-family homes. Mountain Home Park in Brattleboro, where we met Cheri Bishop earlier in the episode, is the largest mobile home park in the state. It’s part of a cooperative with two other mobile home parks nearby, which are collectively called Tri-Park Mobile Home Park. About 900 people, or 8% of Brattleboro residents, live in Tri-Park. Many residents have been here for decades. Mountain Home Park was established in the 1950s, before flood maps existed. By the time FEMA developed flood maps in the 1970s, it was clear that many properties were built in flood hazard areas: both in “flood plains” – where water accumulates – and in “floodways” – places where water can flow at a pretty decent velocity. Many of the mobile homes in the latter area were swept completely away during Tropical Storm Irene. And many Mountain Home residents say that Irene seems to have made subsequent flooding worse. Since our question-asker, Jack Haskell, lives in Brattleboro, he joined Brave Little State for some interviews at Mountain Home. From left, resident Jeff Waite, park manager William Hodgman, and BLS question-asker Jack Haskell stand outside Waite's mobile home at Mountain Home Park, in Brattleboro. Jack was with us when we met Jeff Waite. Jeff’s home, like Cheri Bishop’s, is one of more than 60 units in Tri-Park that are located in a flood hazard area. The Halladay Brook runs right through Jeff’s backyard. Jeff’s property is picturesque, except for the piles of ice and dirt scattered across his lawn even now, two months after the ice jam flood that hit in January. Remnants of ice and dirt remain where the waters of Halladay Brook rose over the banks in January, during a flood caused by an ice dam. Jeff is semi-retired. When the ice jam flooding began, he was napping. Jeff was out of his house for a week. But he’s grateful that it wasn’t worse; no water got in his house. He has flood insurance, and he’s gotten a few checks to replace the insulation that was damaged under his home. When it rains a lot, he keeps a close eye on the brook. “My kids keep saying, ‘Dad, move, move, move, move,’” Jeff says. But he’s been living here for more than 35 years, and the idea is daunting. Jeff Waite, a resident of Mountain Home mobile home park in Brattleboro, would like to stay in his home despite the threat of floods. The Halladay Brook runs through his backyard. For now, he plans to stay. Cheri Bishop, one of the mobile home park’s most long-standing residents, doesn’t want to leave either – but she feels like she may be forced to. Cheri was painting her living room baby blue when we visited, in an effort to make the home appealing to potential buyers. Despite her best efforts, she’s worried that nobody will want to purchase a home located in a flood plain. “I can sell it on the lot, but what are you gonna get? When it’s being flooded on a regular basis, I don’t see that my house is still worth that much. Because nobody wants to pay that,” she said. This is a catch-22 for many Mountain Home Park residents living in flood hazard areas: Who will buy their properties? And where would they go? Tri-Park management is working with city officials to come up with a “master plan” to find people homes on dry land. Funding for these moves could potentially come from state and federal sources, according to Sue Fillion, Brattleboro’s planning director. “It’s in everybody’s interest to work with some sense of urgency to relocate people to safer locations in the park or elsewhere,” Sue said. There’s no solid plan yet, but a deadline of August has been set. There’s another critical issue that Tri-Park’s master plan must address: Since the parks are cooperatively owned, they rely on residents’ fees. If dozens of people leave, the financial viability of the entire park could be threatened. “We’re realizing that if miraculously we could move all these people overnight, we would lose the income from that. And all the other people would be in danger of losing their homes because they wouldn’t be able to pay the overhead to keep the park alive,” said Kay Curtis, Tri-Park’s board president. Keeping the park viable for her neighbors is a major concern for Cheri Bishop. She’s relied on her neighbors over the years, she said, and her son and grandkids still live here. The town can’t force Cheri to move. But the waters might. There is another option for Cheri and her neighbors in Mountain Home — though it would be complicated. To explain, we’ve got to give some background. Since Tropical Storm Irene, the state has been facilitating buyouts of flood-damaged and flood-prone structures, so they can be demolished. The funding comes from FEMA and U.S Department of Housing and Urban Development and the Vermont Housing & Conservation Board. Brave Little State met the people who have been leading this effort, which is in the process of being more formally recognized as the statewide Buyout & Conservation Program: Lauren Oates, the state hazard mitigation officer with Vermont Emergency Management, and Kevin Geiger, the senior planner with the Two-Rivers Ottauquechee Regional Commission. We’re standing in Quechee Village, next to the covered bridge, on the site of a buyout. It’s the first day of spring, and snowmelt is running down a waterfall below us. This is where the Ottauquechee River runs through the village, and Kevin says that during Irene, the water here came up 30 feet. At the time, the building that was in this spot housed a real estate office. 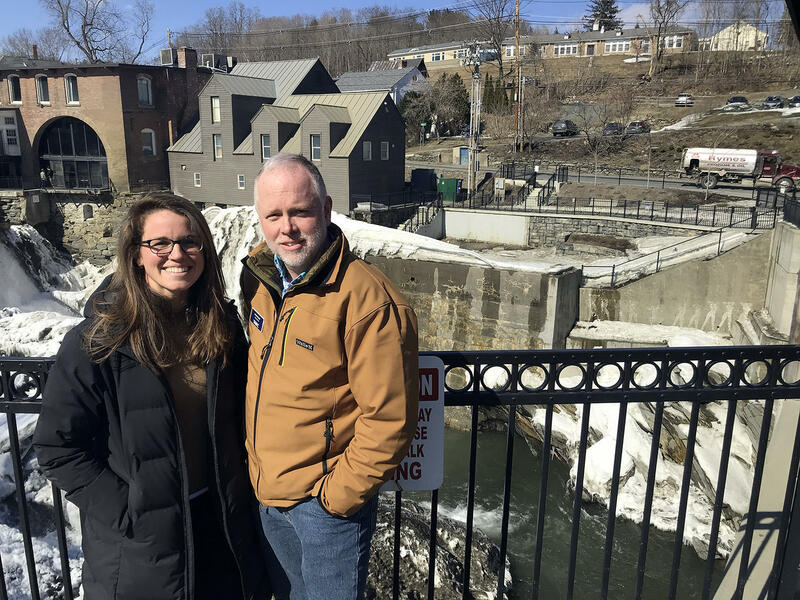 Lauren Oates of Vermont Emergency Management and Kevin Geiger of the Two-Rivers Ottauquechee Regional Commission stand above the Ottauquechee River in Quechee Village. On the far side of the river is a pocket park, on the site of a buyout where a flood-damaged building once stood. Across the river from us are the sites of two other buyouts — two homes that were starting to slide down the steep bank. How many structures is “a ways to go”? Buyouts in mobile home parks, like Mountain Home in Brattleboro, get more complicated, because homeowners don’t typically own the land that their homes sit on — or the land is cooperatively owned, like it is at Mountain Home. But Lauren says that wouldn’t pre-empt a buyout. She and Kevin say they’re trying to be more proactive with the purchases, and they’re also looking to help towns acquire undeveloped lots, and conserve that empty land as flood plain. They’re also aware that buyouts can have a negative impact, by diminishing the affordable housing in some communities. “Stockbridge, where I think 19 homes were bought out, most of them very small kind of A-frames, some of which were seasonal, some of which were permanent … that took a chunk of affordable housing off the market in that town that we don’t have an easy replacement for,” Kevin says. This calm before the next big storm is a good time to think about those bigger questions. Because there will be a next big storm. “Honestly, I wish there was a support group. You know, people could get together and say, ‘Yeah, I was where you were at, and there is hope.’ Because I think that the physical damage is almost nowhere near as bad as the mental damage,” says Mike Lee, who we met earlier in Brandon, and who’s been flooded out twice. “The feeling that, you know, I’ve cracked all my teeth — just driving home, you feel your jaw tighten up, and it’s because you’ve worked your whole life and all the sudden you don’t know where you’re at,” he says. Mike and his wife Stacy are among five families in Brandon who are in the middle of the buyout process. They made the decision roughly a week after the July 1 storm in 2017. It wasn’t an easy choice; they’ve lived here for 24 years. The buyout process takes a long time. The Lees are more than two years in, and they’re just about to find out how much they can get for their one-story ranch. “It’s tough to rip off a Band-Aid slow,” Mike laments. The appraisal will be a fair market value — it won’t take flooding into account — but Mike says he’s terrified the number will come in low. Mike and Stacy have their eye on a house in Pittsford. They both work in Rutland — Mike is a technician and Stacy is a registered nurse — and they wouldn’t mind the shorter commute. With so much uncertainty, Stacy and Mike are trying hard to stay positive — and they say as hard as it is to leave Newton Road, they’re grateful that they’ve got a path out. They say they’re more worried about some of their neighbors. The Lees have a lot of friends around here that they like to ride motorcycles with. Stacy says she wants to maintain those relationships. And Mike says he’ll always have a relationship with this land, even if he can’t live here. Brave Little State is a production of Vermont Public Radio. We have support from the VPR Innovation Fund. If you’re a fan of our work there are two things you can do: leave us a review in Apple Podcasts, and/or make a gift to VPR. Special thanks this month to William Hodgman, Christine Hart, Bill Shepeluk, David Atherton and Tom Donahue. Why Does Vermont Have Such A Housing Crunch? What are the causes of Vermont’s tight housing market — and why aren’t things getting better?